Captain Underpants notwithstanding, no childhood is complete without the exploration of children's literature. But these days, academic demands and the customary load of extracurriculars make it difficult to squeeze in all the must-read titles. This weekend, Rochester Children's Theatre lends a hand by bringing to life The Secret Garden, Frances Hodgson Burnett's classic first published in 1911. As in the novel, the play's main character is Mary Lennox, a selfish young English girl who lives in India with her glamorous but neglectful parents. After being orphaned in a cholera epidemic, Mary is sent back to England to live with her indifferent uncle at Misselthwaite Manor. Shortly after arriving at the mysterious old estate, she hears stories of a secret garden and becomes obsessed with finding it. Along the way, Mary discovers Colin, a sickly, ill-tempered cousin she didn't know she had. As they work on restoring the garden, Mary and Colin are transformed into healthy, well-adjusted kids. The Secret Garden has wide appeal. Themes include the restorative power of nature and self-sufficiency, plus every kid's favorite, questioning the authority of misguided adults. 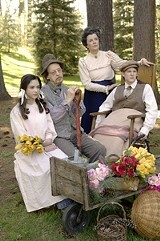 Directed by Fred Neurnberg, the cast consists of seven Rochester actors, including Marguerite Frarey, a seventh grader at the School of the Arts, as Mary Lennox. Frarey has acted in several RCT productions, including roles as Helen Keller in The Miracle Worker and JoJo in Seussical. Shealso appeared in Geva's recent production of Inherit the Wind. With Teddy Geiger's publicist, Frarey could be Rochester's next Philip Seymour Hoffman. The Secret Garden will be performed Saturday and Sunday, May 20 and 21, at 2 p.m. at the NazarethCollegeArtsCenter, 4245 East Avenue. Running time is approximately 90 minutes, including intermission. Tickets are $10 at the box office (389-2170). For more info, go to www.rochesterchildrenstheatre.org or call 385-0510.